They had gathered at Sanaa's grand hall of ceremonies on al-Khamseen Street for a funeral. 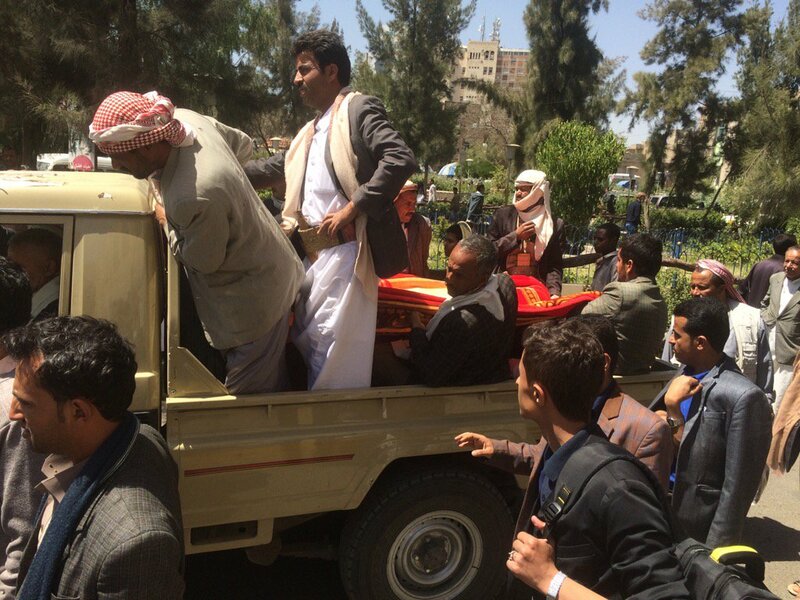 But in Yemen even those who mourn are in the firing line. When we arrived smoke was still billowing as flames ravaged what remained of the venue. They were still finding bodies and human remains.The latter were being collected in carrier bags at times because there were so many. The smell of death pierced the smoke filling the air. Two huge craters mark the place where the bombs from the Saudi-led coalition struck on Saturday afternoon. Hundreds of mourners were packed into the hall for the funeral of the father of the Houthi-appointed interior minister. Wahid Hamid al-Sarari was at the funeral but left to his home nearby just before the bombs struck. He ran back to help and describes the hellish vision which greeted him. "When I got inside we were stepping over bodies. It was terrible. The smoke was so thick. I did what I could helping others to try and rescue who we could. No one would think they would hit a funeral," he said. The roof to the hall is blown away. The floor is strewn with burned and broken furniture and rubble and ashes from the inferno which followed. At first glance very little makes sense here but the longer you look the clearer it becomes.A charred sandal wedged next to part of a chandelier, foam from a sofa resting on top of part of a blood stained jacket. The fire crews and officers shake their heads with disbelief when you catch their eye. In the underground car park they're gathering evidence. 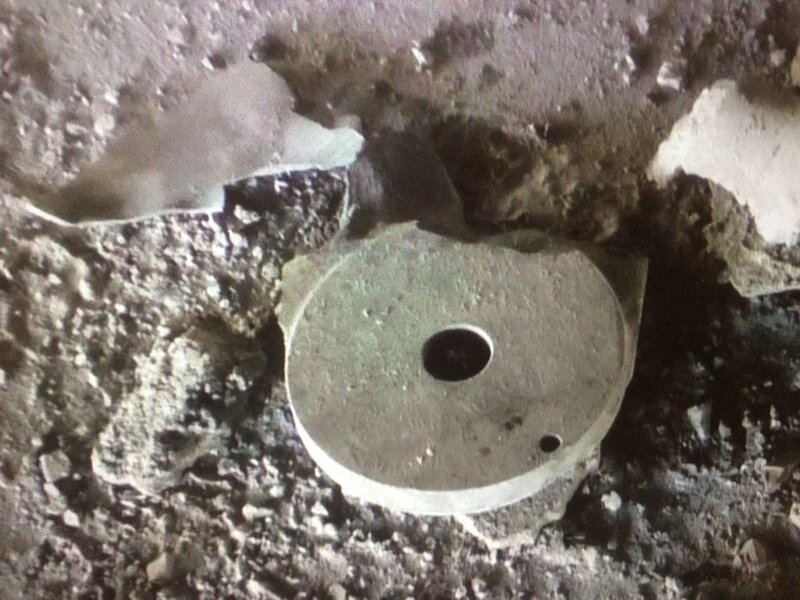 We found parts of a bomb which a Yemeni Ordnance officer tells us is an American mark 82. In Sanaa's hospitals they're overwhelmed with casualties. We pass a long queue of blood donors. Ardel al-olagi, 26, lost several relatives in the funeral attack. The right side of his face bears the painful scars from the blasts. "We are not guilty. Where is the world here? Why is it silent?" He asks. Outside the morgue families wait for what remains of those killed so they can bury them. Inside the stench is overpowering. We're shown a dozen bodies which officials say are victims from the funeral airstrike. The Saudi-led coalition says it will launch an investigation into what happened. But in Yemen where civilians have paid the heaviest price of this 19 month war they say they've heard it all before. Their anger at their suffering and the world's indifference to their plight continues to grow. Britain and the US have called for an immediate and unconditional ceasefire to end the raging conflict in Yemen. As the funerals of 140 people killed in an airstrike in Yemen was held, the attack was met with international condemnation.